SAME DAY RESERVATIONS must be made by calling the Hotel directly. IF YOU WISH A SUNDAY ARRIVAL, PLEASE NOTE THE FOLLOWING: The Hotel, Lounge and Dining Room are not open on Sundays but we are glad to arrange a Sunday guest room prior to your arrival. Call the Hotel at 307-326-5525 to book your reservation for Sunday check-in. If you booked a visit that will include a Sunday stay-over, please note that the Lounge and Dining Room are not open as stated above. Our maid will service all rooms for Sunday arrivals and Sunday stay-overs. No other staff is available. Rooms are NON-SMOKING AND PET FREE otherwise a $150 charge will be assessed. ALL ROOMS ARE ACCESSED BY STAIRS ONLY and can be a challenge for those not used to climbing at over 6000' elevation. Bringing a BABY? Leave a message in your booking so that we can make sure a port-a-crib is in your room at no charge. 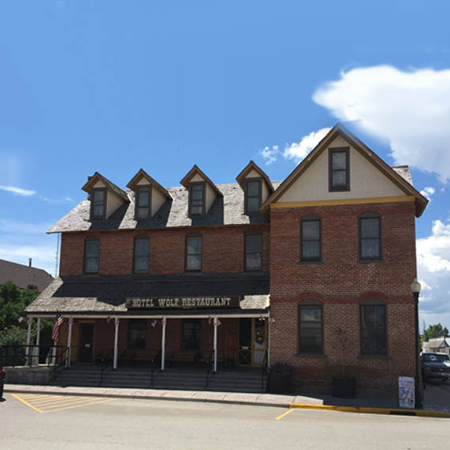 The Wolf Hotel is a charming, red brick, Victorian-style Hotel built in 1893 initially serving as a Stage Coach stop in the Platte Valley. The building is listed on the National Register of Historic Places and is known as the "Grand Ol' Gal of The Valley". The interior captures the original Victorian essence while still meeting the needs of the modern traveler. 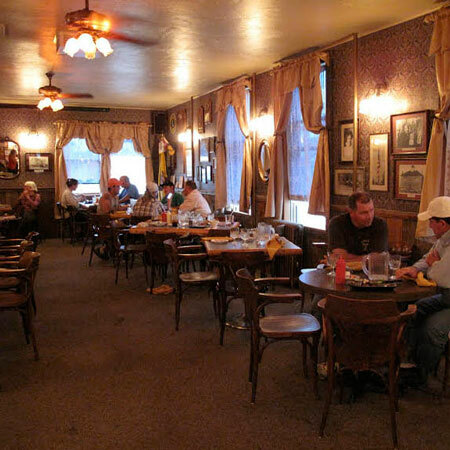 The Wolf is a place once visited by Wyoming's famous and infamous people and today still plays host to locals and visitors alike. 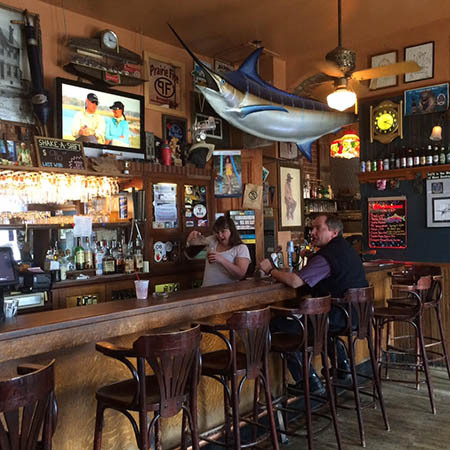 During a stay at our historic Hotel, one can shop the businesses on Bridge Avenue, walk a block to the North Platte River, relax on the porch or enjoy a cool beverage in the Lounge. The outdoor adventurer can book floating and fishing trips with a local guide, or one can take a hike in our beautiful mountains. The opportunities to connect with nature are endless! An upscale lunch or dinner experience is also available in our restaurant Monday through Saturday. Drive through the Snowy Range Mountains on the National Scenic By-Way (Hwy 130) then stay with us at the Wolf Hotel for a truly unique Western experience! Our historic Hotel has ten rooms five of which are Suites. All rooms have been renovated while still maintaining their Victorian appeal. Original furnishings from 1893 can also be found in some of the guest rooms. Nine of our rooms have a shower or tub/shower while one has the original 1927 American Standard pedestal tub. 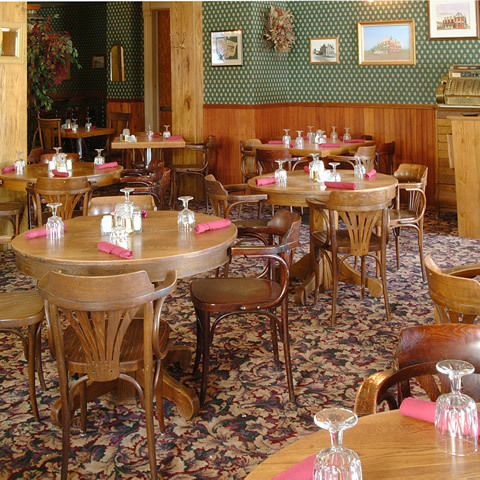 The Wolf is a must stop for a night's stay or to merely trade fishing and hunting stories with locals over a prime rib dinner or a refreshing beverage in the Lounge. A selection of top shelf liquors, micro-brews, fine wines and a variety of cigars can be enjoyed in the Lounge. We are here to help you find the most relaxing, friendly, and stop-light free experience in Wyoming's favorite fishing town. Please call in advance if you have special requirements so that we may better accommodate your needs.